Baaa-baaa... bra? Buzz60's Tony Spitz has the utterly ridiculous details. “Ewe” are not going to believe this.????VO? 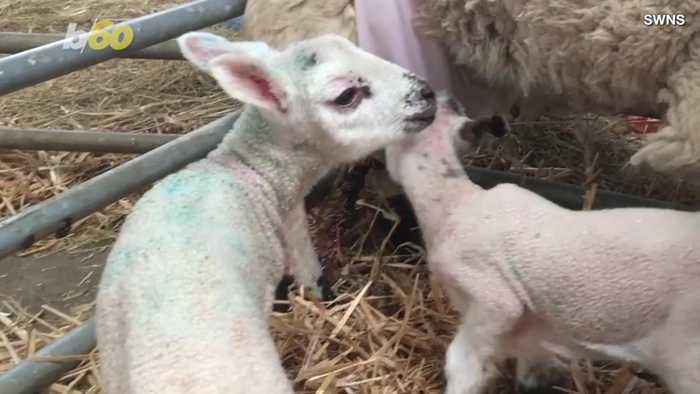 ?According to SWNS, Barnards Farm in the UK recently welcomed a couple lambs into their farm family, but were struggling with an utterly ridiculous problem.????VO? ?According to Kathryn Cross who works at the farm:????VO?? "The ewe is an older girl, perfectly fit and healthy but when her udder bagged up with milk it was nearly dragging on the ground.”????VO? ?Which meant her two new twin lambs couldn’t get any food.????VO? ?Well, one of the farms neighbors had a solution: One of her old double-D bras.????VO? ?Kathryn says her husband cut a couple of strategic holes in the hand-me-down brasier and placed it on the old girl no fuss.????VO? ?Explaining: "The lambs were a bit unsure to start with but with a bit of guidance they soon got the hang of it and are now thriving.”????VO? ?They even say they’ll use the technique again in the future if need be.????VO? ?Which is great! And just goes to show there’s no such thing as a baaaaaaad idea.?? Cumbrian farmer and photographer Amy Bateman may have a magical lamb on her hands - one of her newborns can SPEAK. The lamb - just a few days old and dubbed Harry Potter by Amy's wizard-loving children..